Signable gets your documents signed fast! Rather than emailing or posting the document to the signer, you can send it out via Signable and literally get it signed in a matter of minutes for a fraction of the cost. Signers can sign on their desktop or their mobile device, quickly and easily whilst we make sure the document is legally binding and secure. "Straight forward and easy to use"
After some initial guidance on how to use the system, we were up and running within minutes. The system is so straight forward from both our end and that of our customers. The mobile platform is handy as our team are not all office based and need to use Signable when visiting customers. The team on live chat are so helpful with any questions or queries. They are really friendly and nothing is too much trouble for them to help you with. We have peaks periods throughout the year where we send a higher than normal amount of documents. It is helpful to be able to adjust our payment plan accordingly at these times. Using an esignature company has helped our company with our sustainability policy by reducing the amount of physical resources we use - paper, ink, envelopes etc. If you dislike saving time, money, resources and your environment then this is not the service for you. The trial is the perfect opportunity to see how Signable can work for you. We have saved so much time, resources and money using Signable. It has changed the way we work to make our company more efficient and less reliant on paper - documents, envelopes, stamps. Using the system has reduced space required in our office for storage of the documents as they are all online. Some of the team work remotely and are able to log on to see the progress of documents rather than calling the office and requesting this information. This has meant the admin team are able to focus on producing the documents rather than answering internal queries about whether a document has been signed yet or not. Thanks so much for the great feedback Lorna, it's brilliant to have customers that get involved and chat with the team so that we can help and provide even more value. The ability to sign important agreements and govt. documents and return them allow for quicker transactions.remote employment has always been slow due to the legal documentation that is necessary to get the correct signed documents to the home office. As a field manager I found this software easier and more streamlined than a competitor I was previously using. No long drawn out multiple documents and emails to answer to get a single signed document to the complete status. I have been using online signature software for a few years and always found some bugs. I only use the software a few times a year to on-board new hires or renew my contracts.so for me having to join for an annual fee is a big negative with other companies. I have to pay fees for using it 3 or 4 times where this allowed me to use it for 14 days and come back and pay as I go later and use it again with a small charge. Business is commerce and commerce cost something however this small compared to my profit. no negative issues. I got a good first impression and I will carry that forward. All for not having a flat rate if you only need to send one document out to sign, but as a company that does send out quite a few documents that need to be signed, it's kind of a hassle to keep needing to authorize payment. Maybe if there was an option to pay a monthly fee too? Or is there and I'm just totally missing it? We can get documents signed quicker and it's less stressful trying to get them signed on time. Since we no longer have to print documents out, get them signed, and then scan them back into the server is a lifesaver. "Signable are a Brilliant, Helpful and Happy the best combination." Signable is a wonderful company, that have great, helpful and happy staff on hand to deal with any questions you may have. The Customer Service team at Signable is outstanding and are happy to help with any problems and will not stop until every customer is happy. The Social Media for Signable is unique and is to a great standard.When using Signable I really love the features and the multi-document feature is the best.I also like the Branding settings you can change on Signable as well? I would recommend you speak to them soon and change your business for the better with Signable. I could not fault anything at Signable. Yes, I would say you speak to Signable now to change your business for the better. DA Training and Consultancy always wanted to help the environment and make sure that we are green as much as possible. Signable help us to achieve this with a product that can be used for any business at a click of a button. When we were not using Signable having paper contracts were hard and to keep all contracts and private documents safe and stored correctly without running out of space for other documents was a nightmare but now with Signable, all our problems are solved. "Signable, run by humans for humans!" I like the fact that I can dial their number and get immediate and empathetic assistance from a knowledgeable representative. Customer facing and pro-active. It's not a dislike but, at the moment, there isn't a native API link to Salesforce. Their customer support is superb. Reduction in paperwork and turnaround for hire documents. Fewer mistakes and better customer confidence. Thanks, Anita, really appreciate your feedback. "Signable - a great system"
Signable has saved us time and money when sending agreements for our two main programmes. The instant flexibility in the plan means it is a cost-effetive way to deal with the peaks and troughs of our requirements. The system is easy to use but if you have any problems or questions, the customer service is great. So far so good... the system is doing what we need. We need to get multiple agreements signed by multiple people. Signable removes the need for excessive printing and postage; and ensures the agreements arrive directly to the inbox of the person who needs to sign them. Simple to use, well thought out and cost effective product.. i needed to call support for one small query and was answered straight away by someone who could/ and did deal with my question straight away. More businesses should offer this level of service. I was looking for a simple, pay as you go, solution for digital signatures and form sending to my clients. This does exactly what i wanted. "Customer service is their biggest asset!" 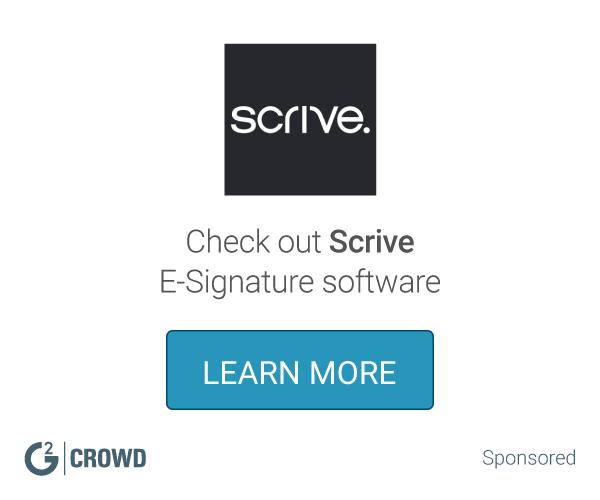 Having used different platforms on a daily basis for E-signatures, this is by far the best platform we have used! Fantastic customer service, professional and customisable E-signatures, easy to set up and extremely cost effective. The only thing I would like to see in the future is an app for Iphones. I am aware there is an Ipad app but I personally like the idea of being able to send Esigs on the move. Ask for a free trial and see yourself! Very quick and positive customer response using this platform due to simplicity and reliability. "Eeasy interface to use and convenient"
Easy to use and I don't have to print sign and scan the documents. Very easy to use for both sender and recipient. Have not found any issues. But sometime the size of the font is set and will not let you change the default size, but not a major issue. Have clients sign the document and email back. So they are not printing them and scanning back which is not good quality. The ease of the system and support from the staff. That two documents cannot be signed independently within one envelope. Documents are signed quicker and we can keep a track at all times. "Intuitive fully functional e-signature provider"
I love how intuitive Signable is and have been particularly happy that all of the features we could wish for are already included. * We monitor all Signable reviews to prevent fraudulent reviews and keep review quality high. We do not post reviews by company employees or direct competitors. Validated reviews require the user to submit a screenshot of the product containing their user ID, in order to verify a user is an actual user of the product. Hi there! Are you looking to implement a solution like Signable?